Made with sturdy, high density plastic and padded with nonabsorbent, stain resistant foam. 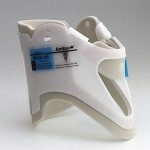 The rigid one-piece construction features an extra large trachea opening and a contoured flip chin piece. Radioluent, MRI and CT compatible. Includes hook and loop closures and sizing code with color, numbers and graphical lines. Folds completely flat for storage.